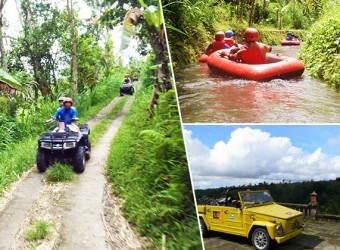 Bali Activity We introduce 3 in 1 package that you can enjoy 3 popular activity in same day! First you drive open wargen along endless rice field. After that you can drive ATV which is vehicle with bif tires that you can drive un-flatten dirt road. At the end rafting with your choice of course! It is perfect tour for who want to be active and fun! Volkswagen, Mini-Rafting, Lunch, Towel Rental, Facilities (Shower/Locker) and Insurance. * Free transport is available from 2 person. Is ATV tandem ride only? Yes, usually, ATV is tandem ride. However, if you and your friend cannot drive it, instructor drives it and you can ride on the back. If you try single ride, you need to pay extra charge of ＄20 for each ATV. Please pay on the day.